Winds generated by the differential heating of the earth pass over the open bodies of water, transferring some of their energy to the water in the form of waves. This energy transfer results in a concentration of the energy involved: the initial solar power level of about 1 kW/m2 is concentrated to an average wave power level of 70kW/m of crest length. This figure rises to an average of 170 kW/m of crest length during the winter, and to more than 1 MW/m during storms. The potential world-wide wave energy contribution to the production of electricity is estimated by IEA (International Energy Agency) to be between 10 and 50% of the world’s yearly electricity demand of 15,000 TWh dependent of the expected load factor and wave regime. A recent study by the DTI and Carbon Trust in UK is stating some 200,000 MW installed wave and tidal energy power by 2050 which with a load factor of 0.35 is resulting in a power production of 6 TWh/y. Independent of the different estimates the potential for a pollution free generation of energy is enormous. Waves are caused by a number of forces, i.e. wind, gravitational pull from the sun and moon, changes in atmospheric pressure, earthquakes etc. Waves created by wind are the most common waves and the waves relevant for the Wave Dragon technology. As the wind blows across the water surface air molecules from the wind interact with the water molecules they touch. This force between the air and water stretches the water's surface, resulting in small ripples, known as capillary waves. Capillary waves create more water surface increasing the friction between water and wind. This adds more energy, which increases the size of the waves, making them larger and larger. When the winds slow down or stop, the waves continue their journey, gradually but very slowly losing their energy. Waves may travel thousands of kilometres before rolling ashore. This predictability of waves is one of the advantages of wave energy as a renewable energy source. An ocean wave in deep water appears to be a massive moving object - a crest of water travelling across the sea surface but to understand wave energy it is important to realize that this is not the case. 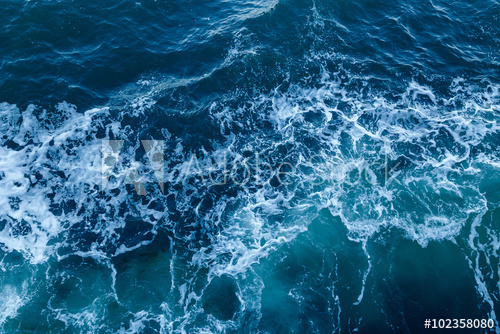 An ocean wave is the movement of energy but the water is not moving; in the ocean - where waves move the water's surface up and down - the water is not moving towards the shore. So, an ocean wave does not represent a flow of water; it represents a flow of motion or energy from its origin to its break up. This break up may occur in the middle of the ocean or against the coast. The water molecules in an ocean wave move in circles. The behaviour of waves depends largely on the relations between a wave's size and the depth of water through which it is moving. The movement of a water molecule changes from circular to ellipsoidal as a wave approaches the coast and water depths decrease. Eventually when the wave rolls up on a beach - and when most of us observe waves - the movement is mostly horizontal. When talking of ocean wave, and a potential deployment of Wave Dragon, the influence of water depth is negligible. Ocean waves are - as mentioned above - essential movement of energy. Waves consist of two kinds of energy. Both types of energies are utilized by Wave Dragon, where this water is stored in an "above-sea-level" reservoir and led out through the turbines (in principle the same technique as used in traditional hydro power plants). The energy in ocean waves is huge. Even that fraction of the wave energy that is potentially or technically exploitable is very large compared to world electricity consumption today. Several analysis have been done to estimate these figures. To quote just one source World Energy Council 2001 Survey that stated the "potential exploitable wave energy" resources worldwide to be 2TW and for European waters the resource was estimated to be able to cover more than 50% of the total power consumption. The energy potential in waves differs widely around the world. Normally wave energy is measured in kW/m, i.e. kW pr. meter wave. The following map illustration roughly depicts the average energy in ocean waves. The Wave Dragon technology is unique in the sense that there is no up-ward restriction from wave heights or wave lengths on its size; this gives a promising perspective for profitable power production.